Crawl spaces are the shallow areas of limited height under a roof or floor that gives access to plumbing or wiring. These are one of the dirtiest areas in most structures. 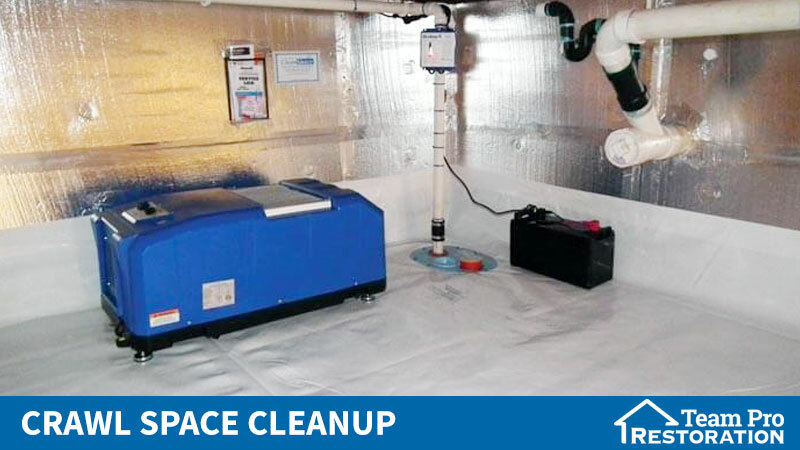 With time, crawlspace may be infested by rodents, insects etc. Moisture might build up too and this leads to growth of Bactria, viruses (from rodents) and mold. With poor maintenance, your crawl space can turn into a breeding ground for airborne diseases. Due to this, your home & family at large are at a risk of exposure to diseases such as; salmonella, hantavirus, and rat bite fever.In most cases, rodents use the crawl spaces to seek warmth & shelter; such places are always small and dark. Doing a thorough cleaning of your crawl space can help eliminate rodents and the dangers of contracting such diseases. Due to the risks of handling the unsanitary conditions inside your crawl space; it’s highly recommended that the crawl spaces be handled by qualified and trained professionals. At Team Pro Restoration, we offer free inspection services where we evaluate the need for a new insulation. In the case of any moisture buildup or mold infestation in your crawl space; we’ll fix it for you. Rodents can tear down and destroy insulations in the crawl space. Crawl spaces aren’t fit for untrained personal: with mud, mold, puddles and high condensation, they are nightmare zones in most homes. As much as we restore your home’s current damage, we also work to prevent future damages. Our services are quite inclusive; we also handle insurance paperwork as part of keeping you covered. Call us today and we’ll be there on time.